Only twenty years ago, batteries where so heavy and expensive that giving any vehicle a 400 km highway range was practically impossible. But thanks to the advent of laptops and mobile phones the battery was reinvented. And while diesel only became more expensive, batteries quickly became lighter and cheaper. In the last 20 years the price of batteries has come down by a factor of 20! That's definitively a disruptive innovation and all of a sudden the heavy electric truck is not only possible but highly probable. The graph shows the resulting cost per km of diesel versus electric for a heavy truck. I hope this helps to put an end to the myth (also propagated by the IEA) that heavy trucks cannot be electrified, even though this chapter also describes some caveats. If I was to write a report on the future of trucks, the battery would get more attention than vehicle efficiency. 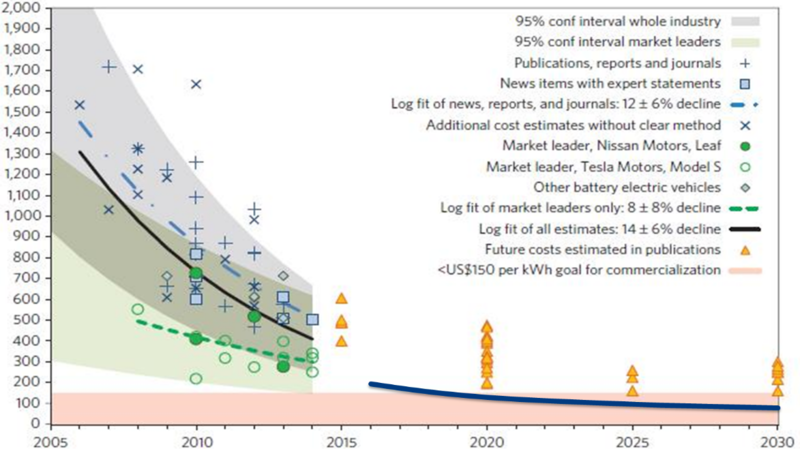 Batteries have by far the most disruptive potential of all the options the IEA report examines. The IEA talks a bit about volumetric density but if you ran the numbers you would know that the size of the battery is not a problem: there is a lot of room under a (semi-)truck and batteries can be given any shape you like. I think the IEA should have been talking about gravimetric density because weight is a serious issue. Fortunately it is becoming less so because in the last 20 years we went from lead acid batteries weighing 30kg/kWh to lithium batteries weighing 3 kg/kWh excluding pack to 5 kg/kWh including pack (i). So the 700 kWh that IEA posits is needed for a heavy 40 ton truck with 400 km of range would have weighed 20 ton 20 years ago. Now we have 3,5 ton left and the weight is still coming down. 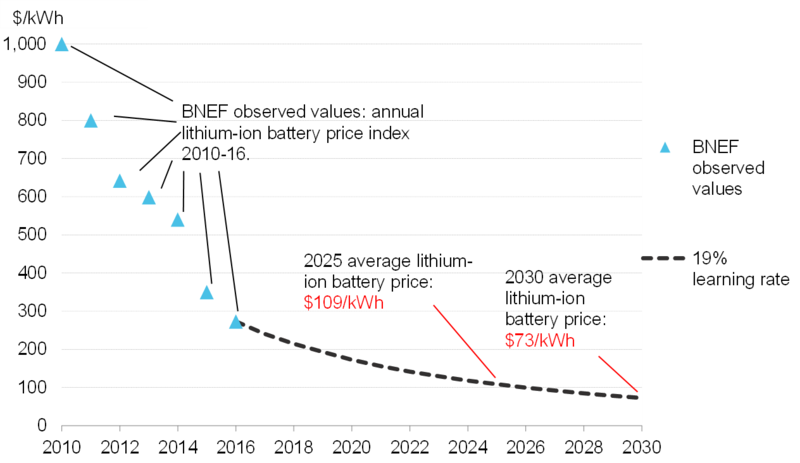 The figure shows a famous graph depicting the fall in battery prices, augmented with a line (2016-2030) that was added based on the research of master student Vedant Sundrani and myself in collaboration with some battery experts at the Eindhoven Technical University. Figure 1 Rapidly falling battery prices. Source  and original research by Vedant Sundrani and the author. Because this is so important let me show another curve to corroborate this. This one is from the Bloomberg New Energy Finance report that came out in July 2017. It’s significantly more optimistic than their prediction from 2016: things are moving fast. Figure 2 We see a price drop by more than a factor of 10 over the 2005-2025 time frame. Furthermore battery degradation has at least halved during that time. Regular lead-acid batteries can be recharged only hundreds of times while lithium EV batteries can increasingly be charged thousands of times. Most Tesla Model S cars will probably have more than 80% of their capacity left after driving 500,000 km. So in the time that regular cars have basically stayed the same, the battery has become 20 times cheaper. That is so radical that it changes everything. It is no wonder that conventional experts have trouble wrapping their heads around the implication: what do you do when “your” technology that has been dominant for over a century but hardly improves anymore suddenly gets competition from some new brat that improved by a factor of 20 over the last 20 years? The answer seems to be a (probably unconscious) combination of ignoring implications and massaging numbers. In 2015 the report can take a relatively safe USD 350/kWh (although the report acknowledges that some companies are already claiming USD 180/kWh). But the price that changes everything (USD 100-150) is supposed to wait until 2050. That is not supported by the findings of e.g. the author or Bloomberg. There is even reason to believe big factories will reach USD 100 in 2020: 30 years faster. If we analyze the price in 2025 the most up to date number is somewhere around USD 100 per kWh and this is the number and timeframe we will use in the rest of this analysis. Contrary to popular belief, the business case for electric vehicles is best for the heaviest trucks and for trucks with the highest annual mileages. “While the technical principles for the electrification of trucks are similar to those available for cars, the greater size and weight of trucks, and their more rugged operations, substantially increase the barriers to batteries serving as a substitute for diesel.” So the IEA claims that scaling up the electric motor and making it rugged poses a barrier. That is backwards. The electric motor has one moving part and is maintenance free. You can hardly be more rugged than that. The IEA also states: “The hurdles to electrification are lower for trucks with lower GVW [gross vehicle weight] and shorter annual mileages.” Once again this is backwards. Yes you need bigger batteries for larger trucks but the weight of the batteries per ton of cargo actually decreases when trucks get larger (as the IEA explains on page 59). Let me repeat that: the cost and weight of batteries per ton of cargo decrease when the truck becomes bigger. When you buy the vehicle you pay more because of the expensive battery. The size of the battery depends on the maximum distance between charging sessions (not the mileage). When you drive the vehicle you pay less because the electric motor requires about 1/3 of the energy and does not need maintenance. So the more km you drive, the more you save. If we assume the battery size the IEA proposes for a heavy duty truck with 400 km of range and we assume a battery price of USD 100/kWh this is the result. You can see that relative to production cost and tax on energy this is small fry. Now it’s time to look at how we will charge our heavy-duty truck. And for that some out of box thinking produces the best results, in our next and last chapter. (i) The energy density of the new first gen Tesla cells was 250Wh/kg. The new 2170 cell is said by Tesla to have a 13% more dense chemistry (bringing it to 280Wh/kg) and more efficient packaging due to the larger size. Some enthusiast calculations put it at 322Wh/kg. That equals 3.1 kg/kWh. The question is of course how much the packaging will add to the weight and how much capacity needs to be left unused in order to prevent rapid degradation. My estimate would be that large blocky battery packs you will find in ladderframe trucks can be more efficiently packaged hence the usual 30% (bringing us to 4kg/kWh) can be reduced. On the other hand you want a battery that can last 1 million km and for a 700 kWh battery that means about 2000 lifecycles. Current Tesla batteries last about 500.000 km for a 85kWh battery before they degrade to 80% so that’s about 1200 cycles. I could imagine an NCM chemistry that lasts longer is a bit heavier, thus 5 kg/kWh. By the way: China already set an official minimum goal for batteries of 200 Wh/kg so 5kg/kWh is quickly becoming the new normal.